Nylon nails. 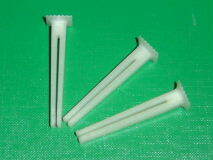 Made from reinforced nylon these nails give an excellent fix in aerated concrete. Insulation Anchors. 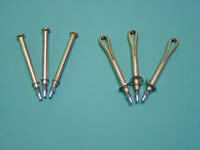 These anchors are designed to hold insulation against aerated concrete walls. Made from reinforced nylon they eliminate thermal transfer. The range provides a quick low cost fixing into all low density building materials such as: Celcon, Thermalite and Durox aircrete blocks. The Loden Anchor will penetrate softwood without the need to pre-drill. Metal or hardwood should have pre-drilled holes. Any low density material must NOT be drilled. 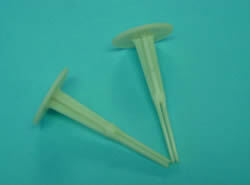 Fig 1 (right) shows the Loden Anchor with the depth setting tool, this is inserted into the centre hole of the fixing. Fig 2 Hammer the fixing with the depth tool inserted, through the wood, into the low density block, until the depth gauge tool comes unto contact with the outer surface. Fig 3 Remove the depth tool. Fig 4 Hammer home the fixing, the example illustrates the outer sleeve of the anchor splaying out to grip inside the blockwork. As there is no need for any drilling, the time saved with the Loden Anchor, means it is extremely efficient and cost effective. Loden Anchor Fixings. These all steel, 'hammer home' fixings give an excellent fix in aerated concrete. No pre drilling of the concrete is necessary. Available in zinc plated finish and stainless steel.